The Vegas Golden Knights are headed back to the playoffs for the second time in franchise history. Considering they have only played two seasons, that is a pretty good ratio. Many would say this team, on paper, is better than last season. With the additions of Max Pacioretty, Paul Stastny, and Mark Stone, they give Vegas more depth and production. But somehow, this team finished third in the Pacific Division and will start on the road against the San Jose Sharks. Here is how they got here. When general manager George McPhee selected his expansion team, he drafted a number of players who were going to be unrestricted free agents to have cap space to work with. Many of the key contributors from their historic first season left to take a payday elsewhere, but McPhee replaced them with equal, if not better, talent. He traded for Montreal Canadiens captain Max Pacioretty and signed playmaking center Paul Stastny. These two forwards helped ease the pain of losing fan favorites James Neal and David Perron. A couple of weeks before training camp, defenseman Nate Schmidt was suspended 20 games for violating the NHL/NHLPA Performance Enhancing Substance Program. He was a major part of the back-end in their inaugural season. 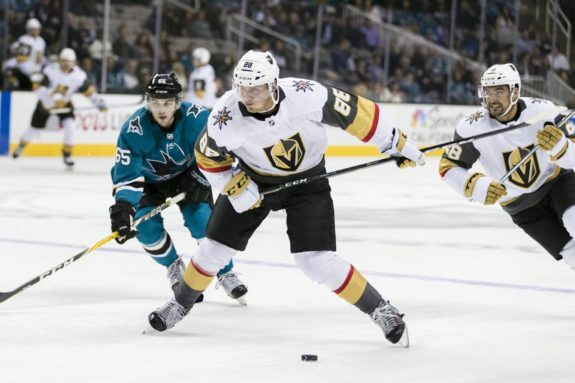 Once the games got underway, Vegas experienced a bit of a Stanley Cup hangover, and without one of their top defensemen, the team went 8-11-1 through the first quarter of the season. After Schmidt returned, the Golden Knights went 15-4-3 for the remainder of the 2018 calendar year. They had allowed four or more goals in nine of the 20 games Schmidt was out for, and during their final 22 games to close out the calendar year, they only allowed four or more goals in four of those games. The remainder of the season was very similar to the beginning; it had its ups and downs. The team finished the rest of the way 20-17-3, going through long winning and losing streaks. The team suffered a number of key injuries throughout the season, leading to their inconsistent play. Reilly Smith and Alex Tuch each missed eight games, Pacioretty missed 16, Colin Miller 17 games, and Stastny was out for 32 games. Perhaps the biggest loss of the season was starting goaltender Marc-Andre Fleury having to miss 21 games. Malcolm Subban wasn’t able to support the load while his counterpart was hurt, going 8-10-2 while Fleury was on the shelf. Everyone’s favorite day always takes place about a month before the season ends and that is trade deadline day. 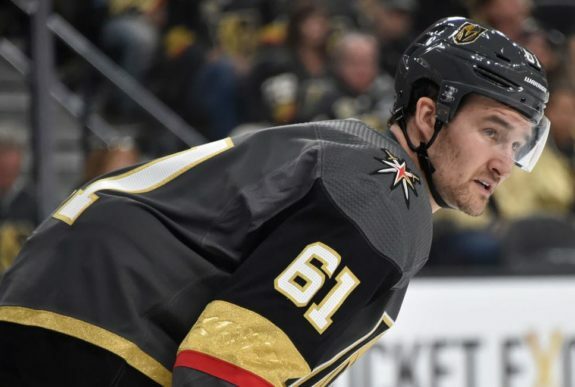 Once again, the Golden Knights made a big splash before the 3PM deadline, and this season acquired the most prized player, Mark Stone. McPhee had a number of assets built up from previous trades, and was able to land Stone and re-sign him long-term. After Stone was acquired, he solidified the Golden Knights’ top-six. His presence on the ice allowed for better matchups for guys like Jonathan Marchessault, William Karlsson, and Smith. In the 19 games after the trade deadline, Marchessault and Karlsson had 17 points, Smith had 18 points in 18 games, and Stastny had 17 points in 17 games. Stone is a smart hockey player who plays a 200-foot game and creates matchup nightmares for opposing coaches. As the regular season comes to an end, it is always fun to look back and hand out some hardware to deserving members of your team. This season, Vegas relied heavily on the defensive side of the game. That is why Fleury gets the nod for the team’s Hart and Vezina Trophies. The Golden Knights’ recipient of their Norris Trophy would go to Schmidt. The team missed him dearly when he was suspended to start the season. He plays on the power play and the penalty kill, and compiled 30 points in 61 games, while scoring a career-high nine goals on 112 shots. 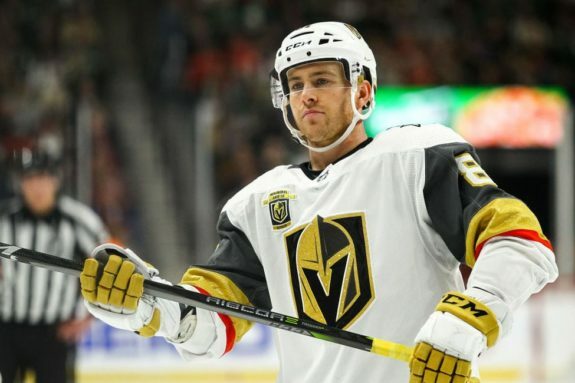 While Vegas has a high-powered offense containing five 20-plus goal scorers, their offensive MVP would be Marchessault. He led the team in goals (25), points (59), and was tied in assists (34). He can get his team going through his offensive capabilities or by using his body to lay a body check on the opposing players. Vegas starts the playoffs against a familiar foe, the San Jose Sharks. They hold a 9-2-3 record against the Sharks all-time, including playoffs. The Golden Knights go in as the underdog, though, as they finished third in the Pacific Division this season. The series will be won in the crease. Martin Jones has had a horrific season, having one of the worst save percentages in the league while Fleury was second in shutouts and fifth in wins. The Sharks went an astounding 32-0 when giving up two goals or less, so to say having good goaltending for the Sharks to win would be an understatement. Every team has to face adversity throughout the season. The biggest hill to climb is how you get out of your funk, and even though the season did not start on the right foot, the Golden Knights are back in the playoffs and hoping to be on the right side of a Stanley Cup hangover this summer.